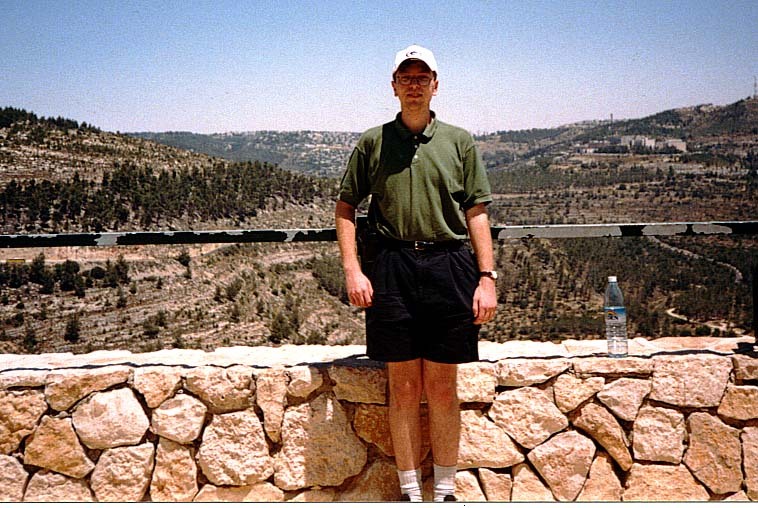 On June 10, 2001, I left for a ten-day tour of Israel, as part of the Birthright Israel program. It was an amazing experience, and I took lots of pictures too. This page tells the story of what we did, and describes (and links to) a lot of the pictures. You may want to check out the CIA World Factbook's entry for Israel if you are unfamiliar with the geography of the country, or unfamiliar with the country in general. I'll drop names of neighboring countries without explaining where they are, so if you don't know which border is on which end, take a quick look at the map there first. If you're just interested in the pictures, you can get a listing of them here. The names are of the form 15-4-blah.jpg. The first number is the date on which the picture was taken (in this case, June 15th). The second number is what order that picture is in for that day (this is the fourth picture in the sequence for the 15th). Finally there is a brief description. Click on a date to jump to that day's entry, or just scroll down to begin reading. I arrived at JFK airport in New York early in the morning. Our flight was supposed to leave at 3:50PM, and check-in began about three and a half hours before that. I met a few other people going on the Birthright trip as I waited, although none of them ended up being from my particular group. Once check-in began, I got my ticket from the travel people and got in line. El Al (our arline) is very paranoid about security. They had their own X-Ray machine at the check-in counter that they made us put our bags through, in addition to the normal X-Raying that goes on at airports. They also ask people questions a little more rigorously than the normal domestic airlines. At the least they asked a series of five or six questions about the luggage and that kind of thing; some people got quite a bit more. They questioned me for an hour. It was a new trainee and her manager, so I assume they picked me out at random to give her some training on the fine art of passenger interrogation, but I don't know for sure. I don't generally think of myself as being a very suspicious-looking guy, at least. She asked me questions about my trip, my luggage, my job, my family, my school, my friends, almost any imaginable subject. It was a lot like being on a date with someone, except it was in the middle of an airport and she was the one asking all the questions. Every so often, the trainee and her manager would tell me to wait a minute, and then walk a little away and proceed to converse in Hebrew. Then they would come back and ask me some more questions. The manager asked some questions here and there, but mostly he just observed. They asked questions more than once at spaced intervals to make sure I gave the same answer. I didn't have anywhere else to be, so it was fairly entertaining. It helped that she was very attractive. They finally decided I wasn't going to blow up the airplane, and they let me go ahead. The airplane itself was nice, a modern 747-400 holding around 450 people. I got a window seat. Next to me was a nice Israeli guy a little older than myself on the aisle, and the seat between us was empty. Every seat had a little TV screen in the back of it, so everybody got their own personal screen. They showed movies on some of the channels, and a couple other things, but one of the neat things was a real-time map showing exactly where the plane was. It was somehow linked into the plane's navigation system. It started from a very large, zoomed-out view that would show about three thousand miles to a side. It then zoomed in to the point where I could identify individual islands I saw out the window. It also cycled through some screens showing the current altitude, speed, outside air temperature, current time at our point of departure and destination, and estimated arrival time. We took off from JFK at about 4PM local time, and arrived in Tel Aviv at about 8:30AM, local time, with the flight taking ten hours. We went through afternoon, evening, night, and morning just like usual, only at about twice the usual rate. We were all advised to get some sleep on the plane, since we were going to have a full day ahead of us once we got off. I managed to sleep for about four or five hours over the Atlantic, which isn't too bad considering that the airline seats are way too small for my frame. We arrived at Ben Gurion Airport near Tel Aviv at 8:30AM, on time. They parked the plane away from any buildings and used mobile staircases to get us off. It made things move considerably more quickly because they opened two separate doors on the airplane. They then used buses to move us to the international arrivals building. Getting through customs was very fast and painless. Waiting for the baggage to come off the plane took forever. When my bag finally came off the line, I noticed it had a different tag than the others. Looking more closely, I saw that it said "V.I.P. Baggage" in a red area in the middle of the tag. I can only assume that this was related to my long questioning at JFK. Either it's their way of saying they're sorry, or it means "watch this person". We got outside the airport and were introduced to our bus. While getting on, I noticed two people sitting outside with rifles across their laps. 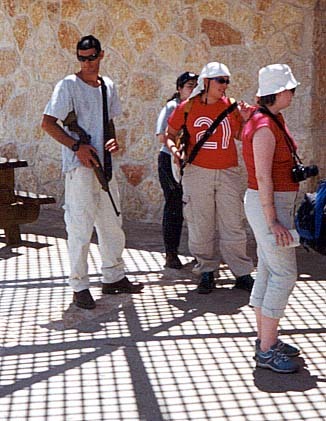 At first I assumed they were just airport security, but later realized (after they got on our bus) that they were the armed guards the Birthright program had promised would be with our group. I never got the man's name. He was only with us on this one day. The woman, Nirit, was with us for the whole tour, and we all got to know her fairly well. She also doubled as our medic, although the worst medical problem we had during the trip were some upset stomachs and a few cases of dehydration. They had both served in the Israeli Army, as every Israeli citizen is required to do. Our first stop was a park where we played some games and got introduced to the rest of the group, as well as our two Israeli tour guides, Lilach and Liora. (The ch at the end of Lilach is pronounced like one of those German hairball sounds, like at the end of Bach.) By this point, it was getting to be near lunch time, and so they drove us to a mall where we could eat. The mall was pretty much like American malls, aside from being somewhat smaller and nicer to look at. This is where I got my first introduction to Shawarma, which is a pita stuffed with chicken, hummus, and all sorts of other good stuff. They also had the standard American chains of McDonald's, Kentucky Fried Chicken, Subway, and so forth. It was interesting to watch who went for the American food and who got more "native" food. We had a while to wander around the mall after that. It wasn't too interesting, though. Most of it was pretty similar to what we have in the US. Usually the main things I like to see in malls are the bookstores, and with all the books being in Hebrew, those weren't very fascinating once the novelty wore off. After eating, we headed off for a trail on a hill. (You have to understand that nearly everything in Israel is either on the top of, on the side of, or at the bottom of, a hill. The amount of flat land, at least in the areas we saw, was very small, at least compared to Wisconsin.) Mercifully, they took us to the top of the hill in the bus, and had us meet the bus at the bottom. The view from the top of the hill was very impressive. There's also the standard prove-I-was-there picture. The entire hill was terraced for farming. About halfway down, there were some ancient irrigation works that we got to see. One crazy guy (not from our group) decided to dive into the small reservoir of water. There was a small cave in the side of the hill where the spring which fed the whole system came out. We went in a fairly open entrance and got in the water, then crawled out through a very small tunnel which fed the water into the reservoir. The tunnel was only about three feet wide and three feet tall, and the water was extremely cold. It's certainly not something for people who are claustrophobic or who have bad knees. After taking a while to find everybody's shoes (lots of people in our group took them off before going in the water, and the ground was gravelly enough to make walking around barefoot painful), we continued our hike down the hill and finally got to the bus. Our next stop was Jerusalem itself, in particular an observation view. We drove into the city with our tour guides pointing out the sites along the way. At one point, Rabbi Klein, the American in charge of our group, showed us a sports stadium. On the other side of that stadium, he said, was a Jewish neighborhood that the Palestinians had been shooting into in the past few months. This was our first taste of a very different world. Although we never were close to any attacks, and we all felt very safe at all times, the situation and the attitudes of the people towards it were all very strange to someone coming from the US. The view from the observation point was breathtaking. The Temple Mount and the Dome of the Rock are featured near the center of the picture, and lots of other historical and religious sites are visible. 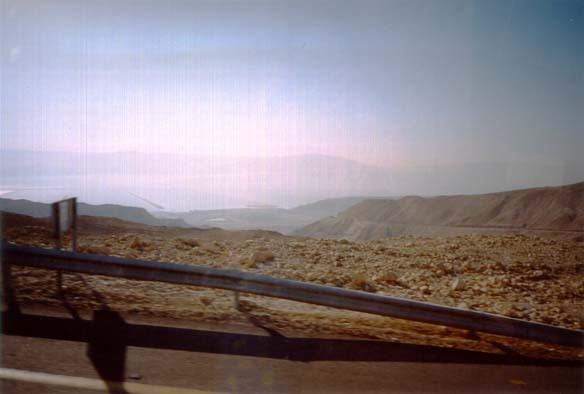 One amazing thing is that, standing there, it's possible to see all the way to the Dead Sea. (This would be off the right side of the picture; it's not visible on film anyway.) We saw what looked like clouds above it. When it was pointed out to us that they weren't clouds but, in fact, the hills of Jordan in the distant haze, it came to me just how small this country is. 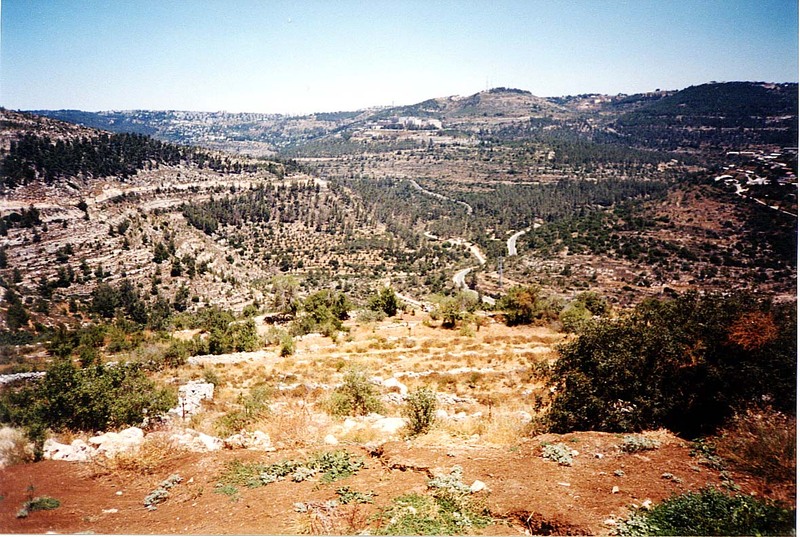 Although it is a couple of hundred miles from north to south, it is very narrow east to west, especially in the area around Tel Aviv and Jerusalem. It's about an hour's drive from the beach at Tel Aviv to Jerusalem, and only a little farther from there to the Jordanian border. The entire country is slightly smaller than the state of New Jersey. Finally we left for our hotel. I say "finally", because some of us had been awake for over 24 hours by this time, and even those of us who had managed to sleep on the airplane were still tired. The hotel turned out to be very nice, and only a block away from the King David Hotel where foreign leaders usually stay during their visits. We ended up with three people to a room, with an extra cot provided for the third person. Normally this would have been crowded, but our schedule was so busy and we saw our hotel rooms so rarely that it didn't matter. Once we got our assignments, we all headed to our rooms to shower or nap. We had a break for about two hours before dinner. A bunch of groups were leaving the next morning, so dinner was supposed to be a big affair with all the groups together, and speakers, and so forth. The food was decent if not exceptional, and there was a lot of it. The main speaker was the former Israeli ambassador to the UN. Although his speech was interesting, several times I discovered myself to be asleep and dreaming in the middle of it. My exhaustion was overcoming my interest and politeness, and I was hoping that it would end soon. The speech, filled with a lot of firey rhetoric and pro-Israel propaganda (what did you expect? ), although very interesting, ended, but there was more afterwards. We finally finished at around 10:30 in the evening. I went straight to my room and to bed where I fell very swiftly asleep. We all got up at about 7:30 this morning for an 8:30 departure time, which turned out to be pretty normal for the whole trip. Of course, some people got up earlier and lots got up later, but that was what was supposed to happen. Breakfast at the Dan Panorama (our hotel) was again unexceptional. Their food was decent but without much variety. On the upshot, they did provide a lot of it, which is good for me; with a fast metabolism and an active day, I tended to amaze people with how much I ate during the trip. Our first stop of the morning was a small park down the street from the hotel. The main feature of this park was a nonfunctional windmill. Apparently a very wealthy Dutch man had emigrated to Israel in the mid-1800s and he brought along some of his culture. The justaposition was amusing. The park had a good view of the Church of the Holy Sepulchre (also visible, if barely, in the Jerusalem observation picture from the day before). Tradition has it that King David (you know, the one who fought Goliath, founded Jerusalem, built a big temple, and so forth) is buried there. For obvious reasons nobody has actually dug up the grave to check, but there's no reason why he couldn't be buried there. This is also where the Last Supper took place, if you're the type to believe the Last Supper took place anywhere. This wasn't prefaced with "tradition says...", so it seems much more certain (again, only if you believe it happened at all). 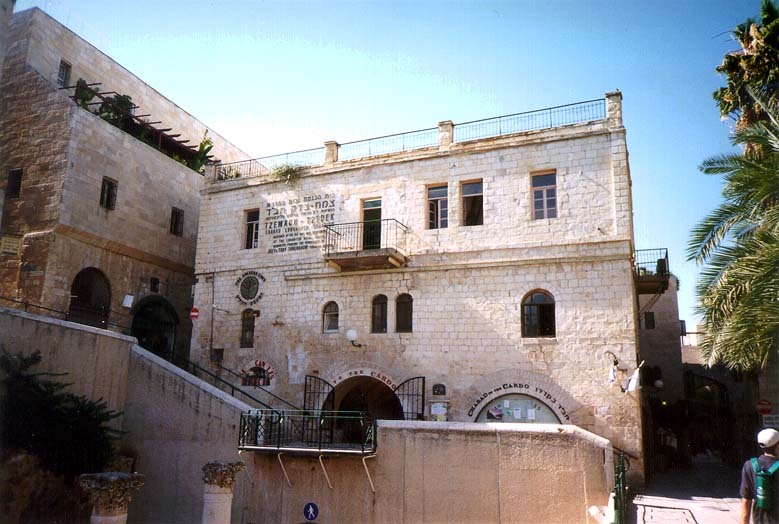 The next stop was a museum called the Museum of the Seam, which is dedicated to the time when Jerusalem was a divided city. For those of you who don't know, between Israel gaining its independence in 1948 and the Six Day War in 1967, the city of Jerusalm was split between Israel and Jordan. Jordan owned the West Bank and East Jerusalem, including all the holy sites. 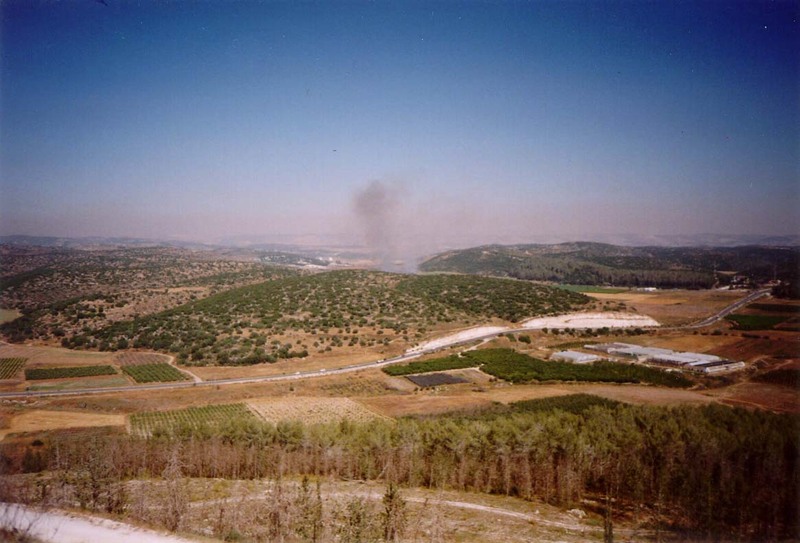 An 80-meter (260-foot) no-man's land separated the two sides in Jerusalem. They had some signs taken from the border. One that I didn't get a picture of was actually mounted on a piece of the concrete wall on the border. The sign was positively riddled with bullet holes, and dents where bullets had hit but not punched through. The wall it was mounted on was likewise filled with pits from impacting bullets. Our next stop was the Western Wall a.k.a. the Wailing Wall a.k.a. the Kotel (see also another picture and a third picture), which I'm sure all of you have at least heard of. It got the name Wailing Wall because Jews tend to very softly vocalize their prayers, just loudly enough to be understood by themselves. The total effect of several thousad people doing this all at once in the same place apparently sounds a lot like mass wailing. It's called the Western Wall because it's a section of the western wall of the Temple Mount. When King David went to build his temple at Jerusalem, the mountain he picked out for it wasn't really big enough to make the grand temple he envisioned. So he built basically an enormous box over the top of this mountain and another mountain to provide a nice flat base upon which to build. To give you an idea of the dimensions of this structure, the portion you see in the picture is perhaps one-sixth of the entire length. 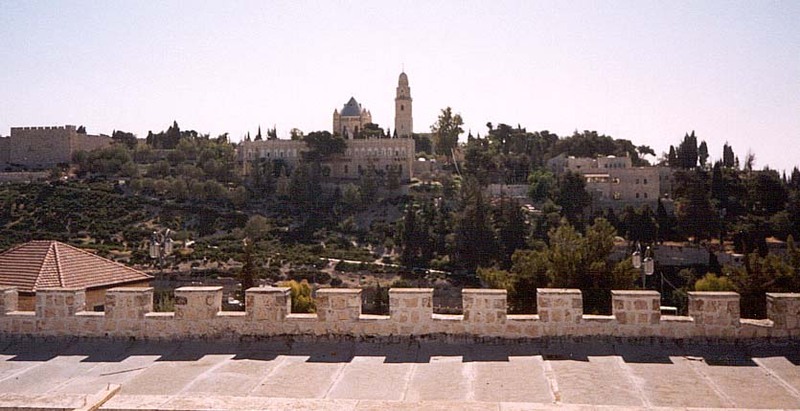 An aerial view of the Temple Mount is available on another site. The small open plaza on the left side of that picture is the plaza you see in my picture. 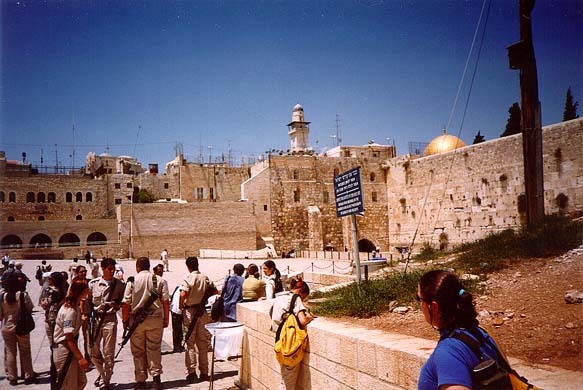 The Dome of the Rock is the famous structure atop the Temple Mount today. You can see it very clearly in both of the above pictures; it's the enormous golden dome. Apparently it used to be solid gold, but now its structure is anodized aluminum with gold plating. It was built by the Muslims in 687AD, and it's the first major Muslim architectural work. It's quite an impressive structure, even seen from afar. 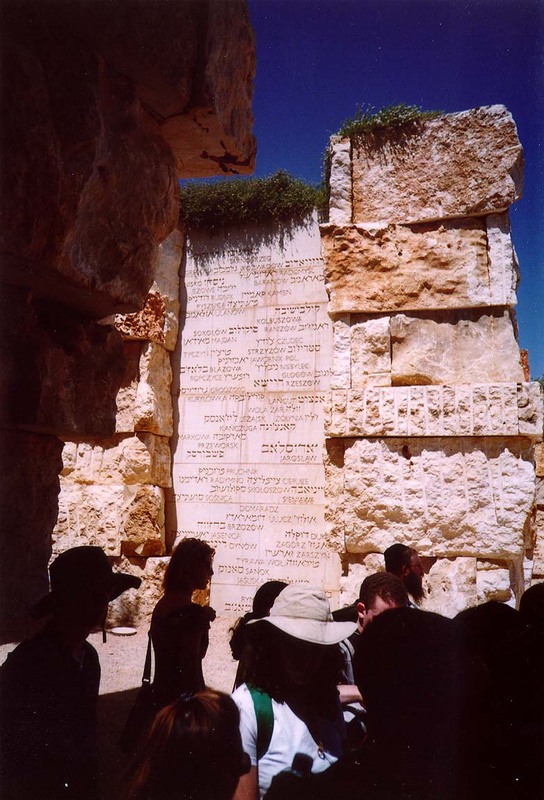 The Kotel is an important site in Judaism. In 70AD, the Jews revolted against their Roman rulers in a three-year war, and the Jewish temple atop the Temple Mount was destroyed as part of the Roman attempt to crush the Jewish people. (This was not the first time this had happened. The Romans actually destroyed the second temple; the first one was destroyed by the Babylonians a few hundred years earlier.) 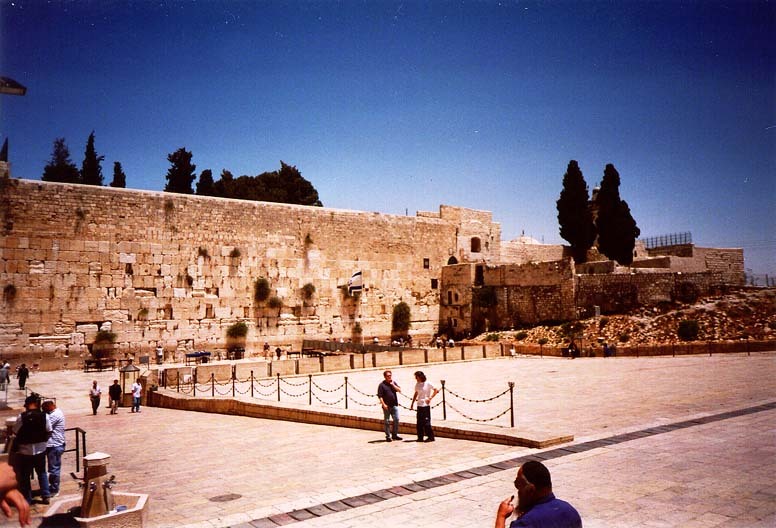 The Kotel is, in theory, the closest spot to where the temple used to be, and has evolved over the centuries to become a holy site in its own right. 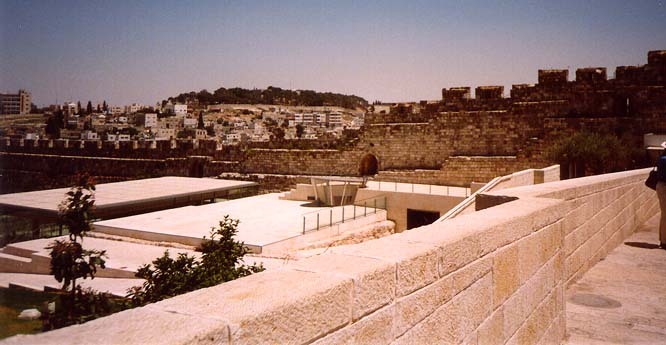 The wall beyond the plaza is mostly obscured by the buildings in the Muslim Quarter of Jerusalem. There are tunnels which run underneath the Muslim Quarter and right up next to the wall, which we got to tour. The big rock at the bottom of the picture with all the holes in it is actually about five or six feet tall. The entire width you can see there (about 15 feet or so) is all one stone. It actually continues about six more feet to the left and nine more feet to the right, and weighs about 120 tons. 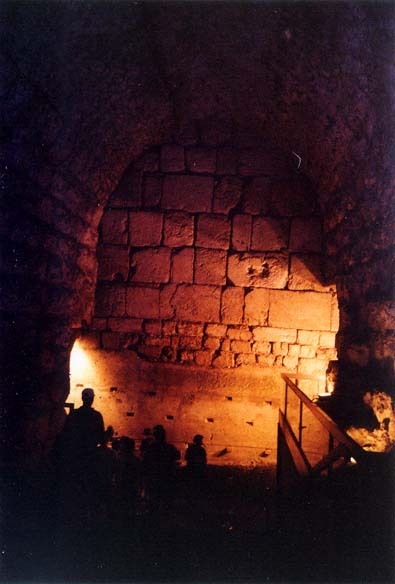 These enormous stones in the lower sections of the wall were placed around the time of King Herod (roughly 40BC), and are a mystery similar to the mystery of the pyramids. Although these stones don't have the amazing precision displayed in the pyramids, the stones are so enormous that they could not have been moved with modern techniques, and nobody knows how it could have been done over two thousand years ago. 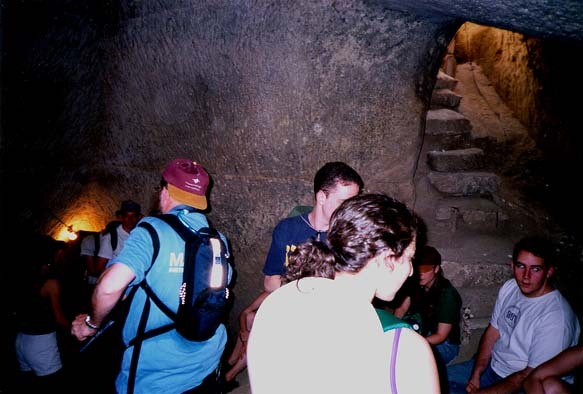 Somewhere below the level of the tunnels we were in are original stones placed during King David's original construction. At the top of the wall, the stones are probably less than a hundred years old. In between, you see all ages. The incredible dedication to this work makes any similar effort in the US look terribly small. The closest things I can think of here are the Brooklyn Bridge, maybe the Sears Tower, the Washington Monument. Will anybody even have a glimmer of remembrance of these things three thousand years after their original construction? I really doubt it. After this, we went to visit a museum about the ancient temple, and on the way we saw the ancient city walls. I don't know if these are the original walls of Jerusalem or if they have been destroyed and rebuilt, but regardless they are old. 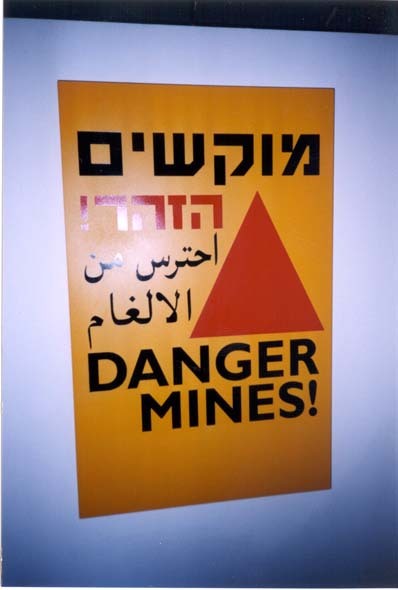 They even provided a good point of resistance for the defending Jordanians during the Six Day War. They managed to hold out on the walls for a while, until a brave Israeli driver crashed an armored personnel carrier through one of the gates and broke through their lines. Next to the museum is an archeological dig next to the wall. You can see a large pile of stones next to the wall; each of those stones is about six feet on a side. 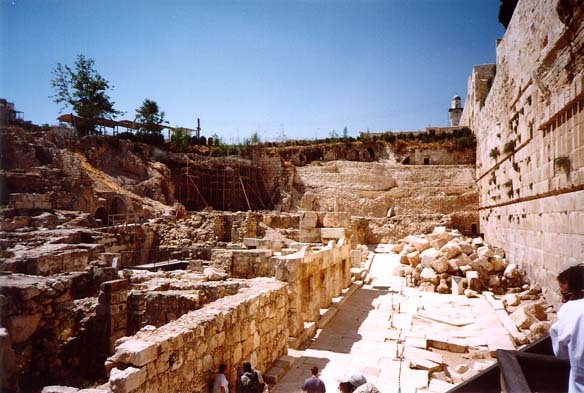 When the Romans destroyed the second temple, they didn't bother to destroy the large stones, but just pushed them over the side of the wall and onto the street below, ending up with this big pile we see today. 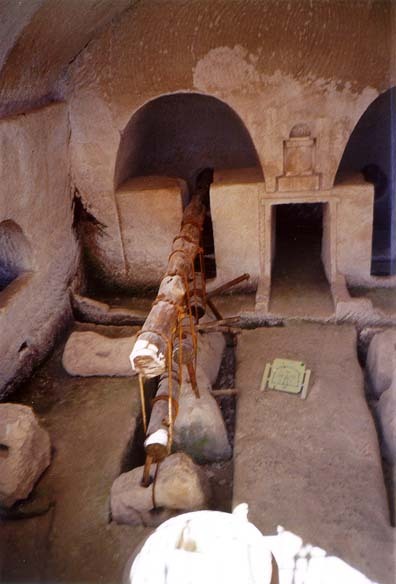 That is what the street level was two thousand years ago, although it's about thirty feet below the street level today. The rocks are actaully resting on the ancient street, and you can see how it was bent and broken by the impact of these enormous stones. Finally, we broke for lunch. This was one of only two times when we had to buy our own lunch. The Birthright Israel program is so nice! They took us out to an area with a bunch of street vendors and the like, and basically gave us a free run. We were told not to go down one street because that led to the Muslim Quarter, and bad things have been known to happen to random Jews wandering around there. The rest of the area was very nice. The number of people hanging around and doing things, and the interactions with the shopkeepers is something you just don't see in the US. I got another Shawarma. (Anybody looking for a food-related business to start in the US, this would probably be a good one. They're really good even for my Americanized tastes, and I've seen nothing like it here. They appear to be easy to make with simple ingredients. Of course, I may beat you to it.) Afterwards, I had some time to kill, so I wandered around a little and did some souvenir hunting. A wrong turn trying to get back to our meeting area resulted in my one and only experience with being lost in Israel. A very nice Israeli tried to help me out, but the group he saw was not my group. There were often several Birthright groups in the same area at the same time, the way the schedules worked out, and this got to be a little confusing from time to time. His advice didn't help much, but going back the way I came got me back on the right path without any trouble. It was around this point that I began to realize something. Nearly every single Israeli we met, and I really mean nearly every single Israeli we met was extremely helpful and extremely happy to see us there. A man in a shop was giving out special Birthright discounts (although he probably could have been bargained down anyway). 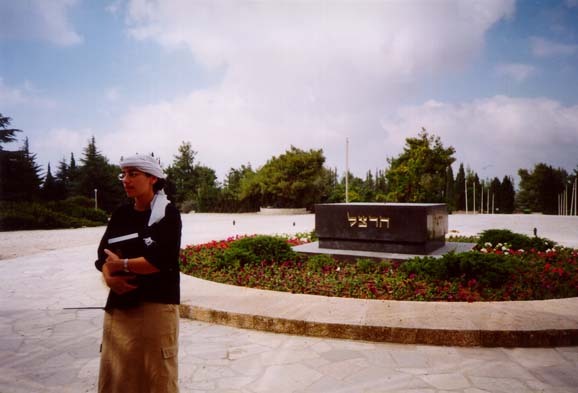 With the sole exception of Birthright Israel, each and every sponsored educational trip for the summer of 2001 was cancelled. Birthright Israel is no small potatoes, bringing about 8,000 people to Israel this summer, but the magnitude of the cancellations was pretty staggering. 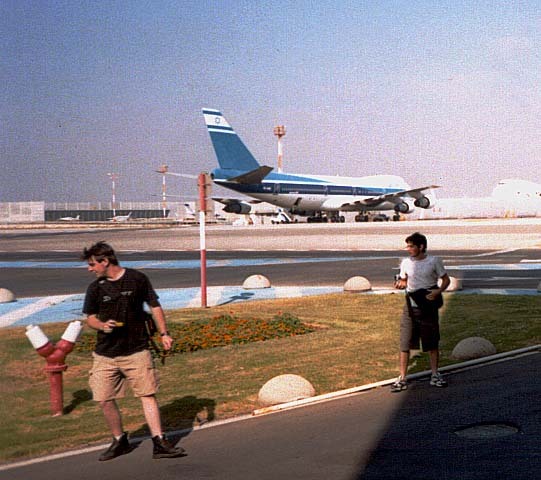 General tourism was also significantly down because of the violence and trouble with the Palestinians. 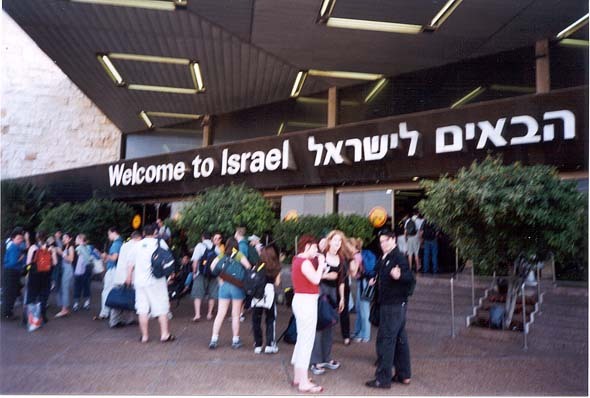 The presence of those of us who did travel there was very gratifying to the Israelis, who in general seem to feel somewhat abandoned by the overseas Jewish population during this time of trouble. Our being there was a big show of support, and they let us know how much they appreciated it. Once we got our group back together, we walked around the Old City a little bit. Our first stop was down the road we were told not to go down before, because it led to the Muslim Quarter. We only went as far as the checkpoint, with a bunch of Israeli soldiers. They all started posing for us as we snapped pictures (somehow I managed not to get one, though), and they were very nice and happy to see us (like I said above). Then we saw a giant solid-gold menorah. Apparently it was made in anticipation of being placed in the as-yet-unbuilt third temple. It's six feet tall and really huge. 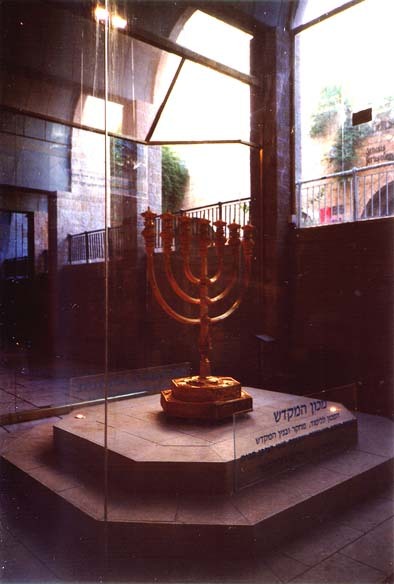 I don't know how good the prospects are for getting the temple built, as it would probably make a lot of Muslims very angry, but the menorah itself is amazing. Our path took us by a nice synagogue. Nothing too remarkable about it on the surface, but the story behind it is interesting. 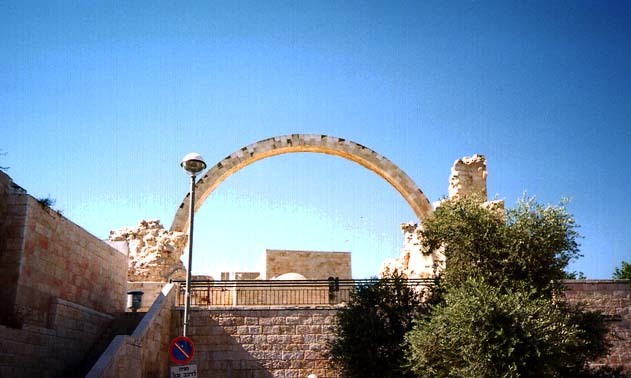 During the Six Day War, when the Jordanians were retreating from the city, they destroyed every single synagogue in the city with the exception if this one. A little farther down the path we came to this archway, which turned out to be all that's left of what was once a famous synagogue. (To be fair, it sounded like it was errant Israeli bombing, not the Jordanians, that did it in.) That wrapped up our tour of the Old City and we headed back to our bus, and then to the hotel to eat. That night was the Birthright Israel Mega Event. It seems that they managed to have two thousand Birthright participants in Jerusalem this night. A lot of the groups, like ours, had just arrived, and a lot of them were at the end of their stay and about to leave, and a lot in between. Another example of the warm reception by random Israelis, some woman we happened to run into on the sidewalk on the way to the convention center was just going through our crowd telling people "Welcome to Israel!" They had live music ranging from the bizarre (guys playing huge steel drums with metal grinders while dancing) to the locally-famous interspersed with various speakers, including some of the kind, wealthy people who made this whole trip possible. They seemed pleased at the reception they got; certainly the crowd was ready to applaud at just about every other word they said. After all the speeches there was live dancing, and also buses going back to the hotel for those who didn't want to stay. I have to say that I admire the stamina of those who stayed on, as I was very tired by this point after a very busy day. I took the first bus back and went right to bed. This morning we did our usual morning routine, then headed straight for the bus. Our destination was an archeological dig at Bet Govrin where they're excavating an old pagan city built at the site of an even older Jewish city at Tel Mashem. (Spelling might be off on that one.) 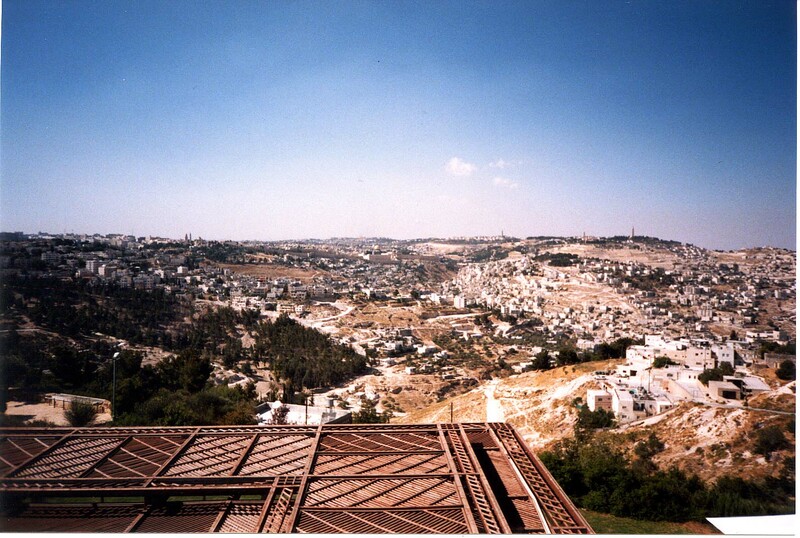 The Hebrew word "Tel" means a hill with a city on top. Hilltops seem to be popular places for cities in Israel. The basic history, from what I remember, is that the Jews settled the hilltop, then got driven out. The pagans moved in and settled the hillside just below the hilltop. They carved basements for their houses out of the very soft rock that made up the ground in this area. When whoever it was came through and drove the pagans out, they destroyed their houses and filled in their basements with junk to keep them from being useful to the invaders. As is typical for archeology, the ancient culture's junk is highly interesting for us, and these basements are the focus of the dig here. After showing us around the partially-excavated cave and telling us about the history and so forth, they put us to work digging in a room that was only barely dug-out. There was enough ceiling space in certain spots for the shorter members of our group to stand straight. In the rest of the room, even they could only straighten out if they were on their knees, and those of us who were taller couldn't even manage that. We used small hoes to push dirt into buckets, all the while searching for pottery or bones. We found a lot of rocks. The rock in the area is so soft that the criteria for whether some lump is a rock or a piece of pottery was to try to break it. The rock would crumble in your hand, whereas the pottery wouldn't. Bones were easy to identify by sight. Dirt went in one bucket, interesting stuff in a second. When the dirt bucket got full, we got a new one. After a few rounds of this, we formed a bucket brigade and passed all of them outside for sifting. It turns out we missed a lot of stuff in the dirt buckets, but that's what the sifting was for. The cave we were just in was partially excavated. After we finished sifting, we went for a cave that was left in the state where they found it, aside from making a small set of stairs for the entrance. It was very small, and lit with candles on either side. There were several places where the only way to get through were to slide through on your belly or on your back, depending on how the situation was set up. There was no turning around, since all 30-odd of us were coming through in a big chain at the same time. It took at least 20 minutes to get through the whole thing, and it started to wear a little thin near the end. A couple of times we hit rooms with holes in the ceiling that let in sunlight and tricked us into thinking we were through, but the holes weren't the exit, and they weren't big enough to get through anyway. Finally our crawl ended in a nice big room with stairs leading up to the ground level. We had gone through at least a dozen interconnected rooms during this tour. Either the people who lived here liked really big basements, or they connected with each other's basements. Next, they took us to the shack where they assemble pieces of pottery into complete pots that would go to a museum or something. After they talked about that process for a little while and tried to sell us their t-shirts, they let us go out behind the building and sort through their reject pile. Any fragments that aren't interesting enough they just dump in back. It's a flat area maybe ten feet square that looks like it's covered with gravel at first, but if you look more closely you see it's bits and pieces of pottery. It crunched under our feet as we walked along it, pieces breaking with every step. 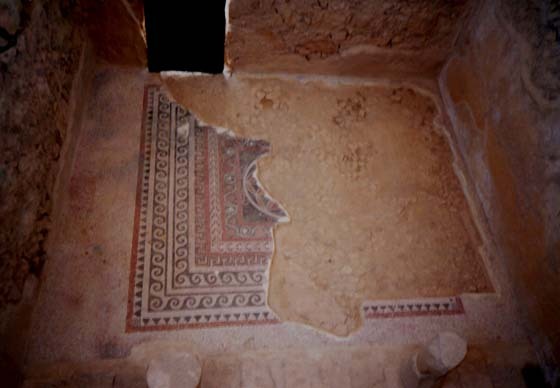 We looked for the rare piece that was interesting enough for us to keep but not interesting enough for the archeologists to keep, and found a few. All of the stuff we were breaking was 2,000 years old, but uninteresting. 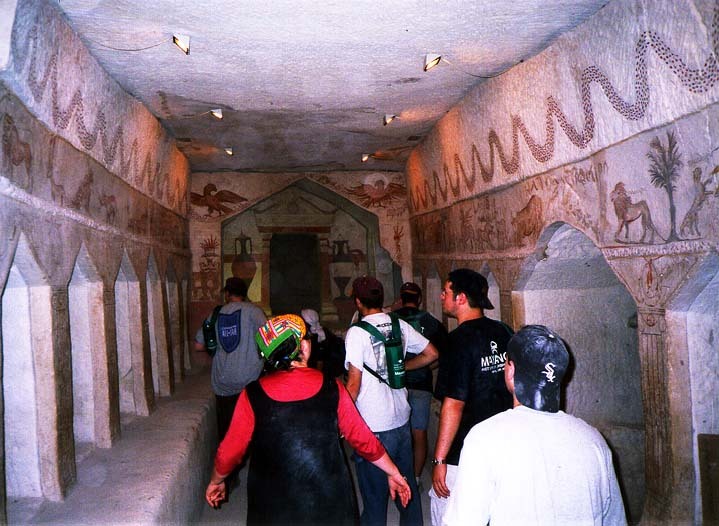 We wandered off down the hill to a rest/picnic area to use the bathrooms and grab some water, then we went into an old excavated crypt where we hung out to talk about what we saw, put stickers on our maps where we'd been, and so on. The outside air temperature was probably around 95F; inside the crypt (or any of the other caves, for that matter) it was very comfortable, maybe 70F, so it made a good place to stop and rest. We also saw a fully-excavated cave. 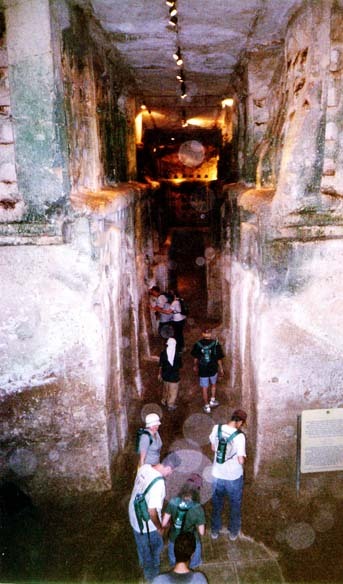 As you can see by comparing against the people in the picture, the cave was at least three or four stories tall. At the far end, you can see little holes cut in the walls. These were about eight inches square, and were found all over the walls of this cave (we also saw a few in the one we had crawled through earlier). Nobody knows what they were for. The running joke in our group is that they were used to hold human heads. 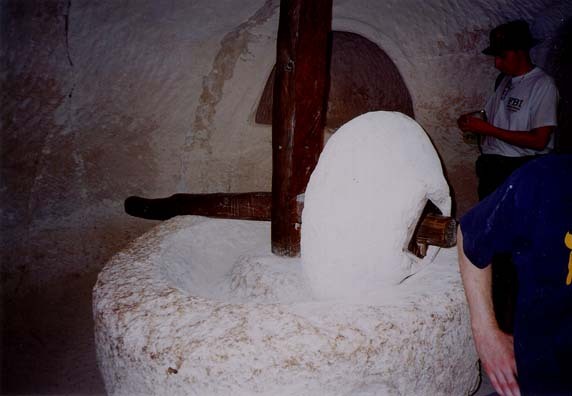 Another cave we visited had old olive-oil making technology. There was a thing which ground olives into pulp, and then another thing which took the pulp and pressed it for the oil. I can only assume that the wooden pieces were not original, but the stones were. On our way to the next site, we stopped off on a hilltop and got this view of another hill. I have no idea how they figured this out, but we were told that that hill is supposedly where the battle between David and Goliath took place. True or not, it was neat to see. After all, if I pointed to a random hill near my apartment and claimed that, I'd be laughed at. Here, I at least have to consider the possibility that it's true. 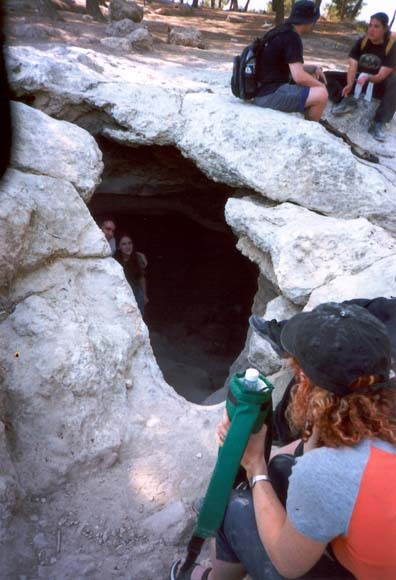 Our destination was a natural cave which had served as a hideout for Jewish rebels against the Romans for three years. It was extremely small with a lot of twisting, restricted passages. The main entrance was just barely large enough to fit through. Getting in required lying on your stomach, arching your back, and wiggling through. Once inside we had a few people with flashlights who tried to light up the place for the rest of us. After three years, the Romans finally figured out where the rebels were hiding out, but they couldn't get in. With it being so difficult to get through the entrance, anybody coming through who wasn't wanted by the people already inside would be easily killed. So, they simply piled up brush and wood against the mouth of the cave and lit it on fire, killing everybody inside. With that story on our minds, we walked back to the bus and headed home. Dinner was a quiet affair, with only a few Birthright groups in Jerusalem at this point. After dinner most of us went straight to bed. Tomorrow was to be Masada. 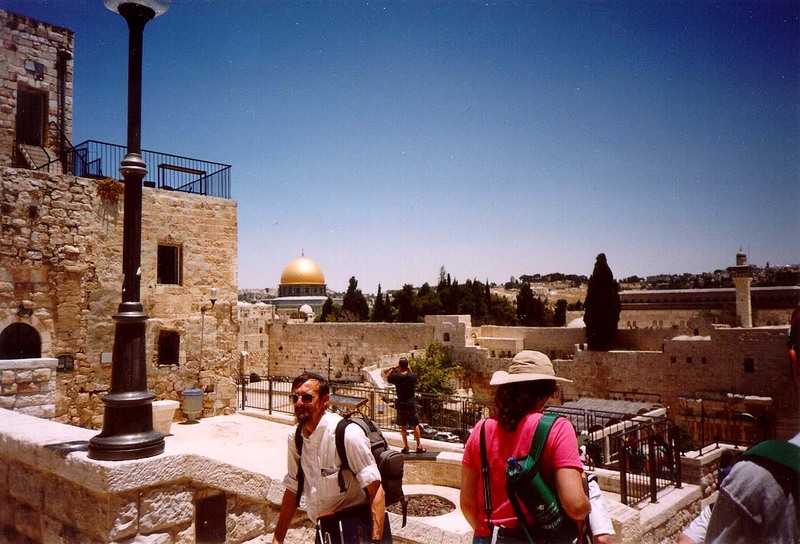 We head south, visit the Dead Sea, climb Masada, and do a bunch of other stuff. In order to accomplish this, we have to get up at 5:30, so we weren't too anxious to stay up late. 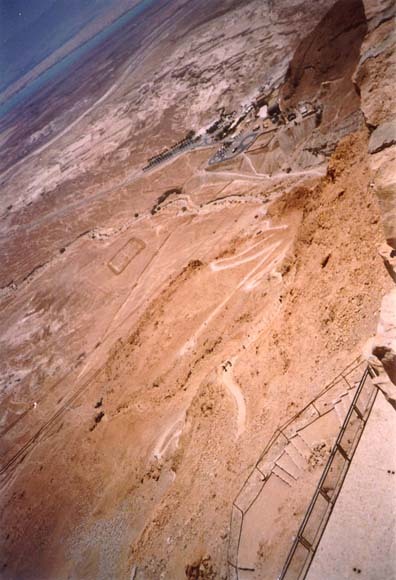 Today is labelled as Masada because Masada is the most significant thing we do of the events planned for the day. 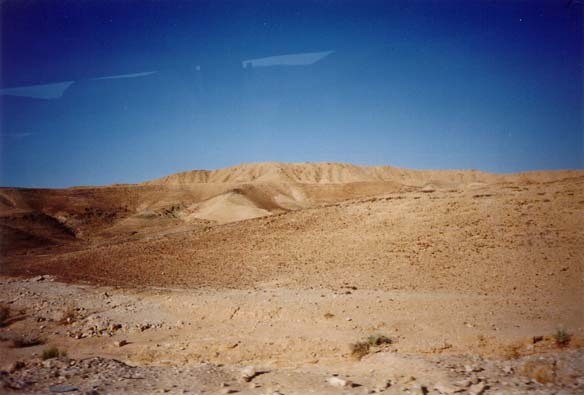 (As to what Masada is, if you aren't familiar with it, I'll get to that in a little bit.) The first thing on the agenda is visiting the Dead Sea. 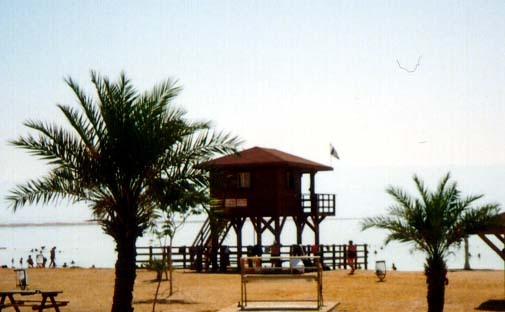 The northern end of the Dead Sea is actually quite close to Jerusalem, but that puts it within the West Bank which is not generally a healthy area to travel in. 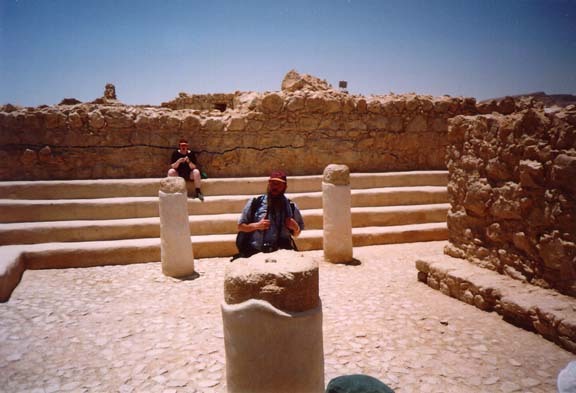 Instead we drove about two hours to the south, which put us near Masada anyway so it wasn't a big loss. Our route took us through the Judea Desert (and another picture; the Dead Sea can be seen in the distance, and the hills on the other side of it are in Jordan), which surrounds the Dead Sea. At this point we were already several hundred feet below sea level. 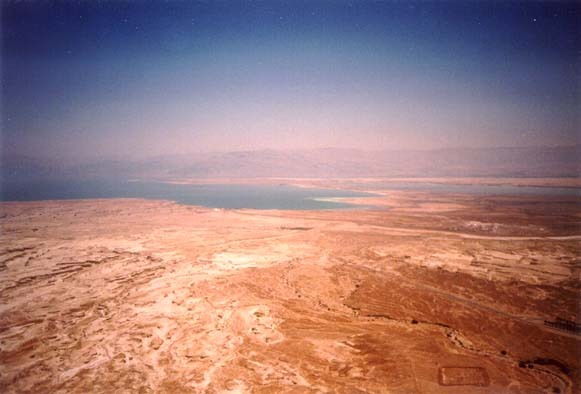 The Dead Sea itself is about 1,300 feet below sea level. Obviously, unlike most lakes, there's no river out to the sea; water won't go up 1,300 feet by itself. 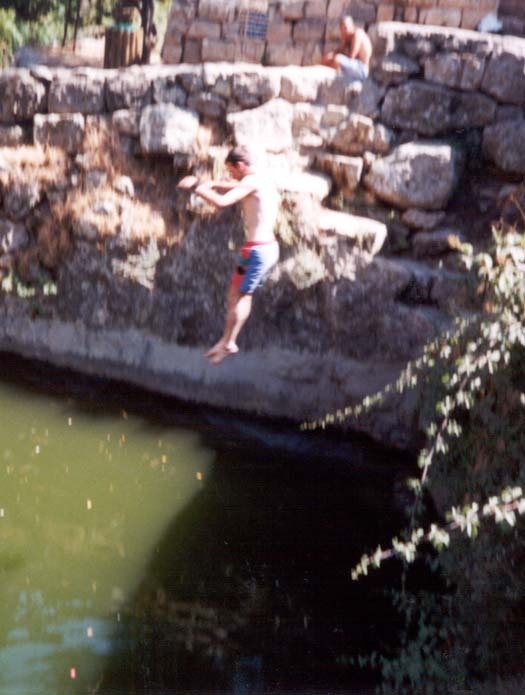 Instead, water comes in (primarily delivered by the Jordan River) and evaporates, leaving all the minerals behind. It's the same process that made the oceans salty, but it happens about a thousand times faster here. Salt makes water heavier, and easier to float in. 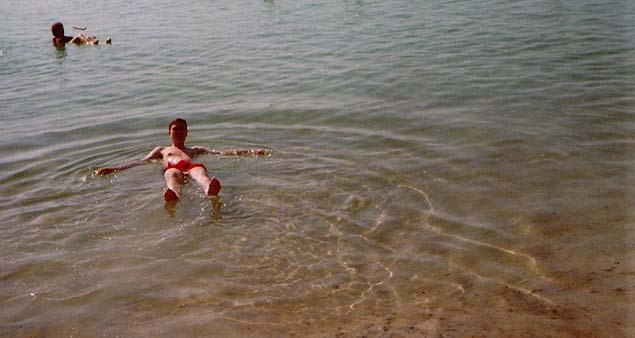 The Dead Sea is so salty that it's possible to float with a good portion of your body out of the water. The Dead Sea is so salty that a single drop of water in the mouth can be tasted for half an hour afterwards. Nothing can survive in the water. A single mouthful, swallowed, is fatal. It was really fun to be in, so long as it didn't get in the mouth or eyes. The feeling of bouyancy made it different from a normal pool, and there were a lot of different positions to float in: back, stomach, standing, you name it. The water felt almost oily, and once we got out the minerals had to be scrubbed off with soap. On our way back to the bus, I noticed a funny sight: a lifeguard shack at the beach. They even had a flotation ring! There is no way anybody could ever drown here. Even if they tried really hard, it could not be done. Thinking about it, though, it makes sense. Somebody could panic and be stuck away from shore, and the ring would give them something to hold on to, but the juxtaposition is still very amusing. 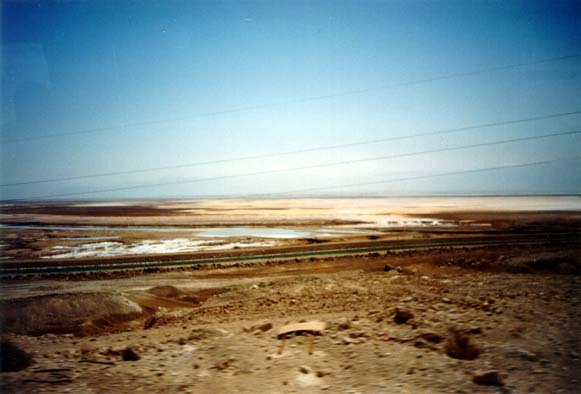 On our way out, we got another nice view of the Dead Sea and the desolate surroundings. A few minutes later we came to Masada. (Another picture.) 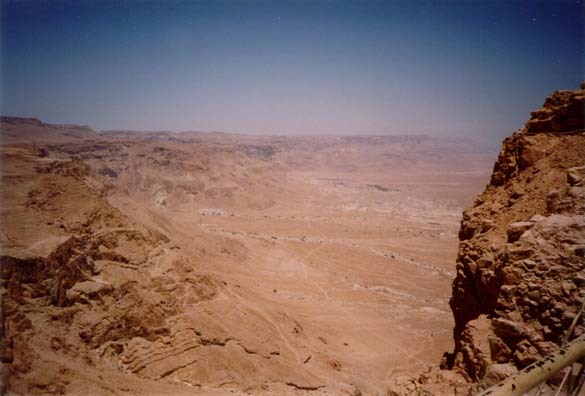 Masada is a mountain next to the shore of the Dead Sea. It has a flat top and nearly vertical sides, and there are deep valleys between it and the neighboring mountains. Because of this, it's a natural site for a fortress. 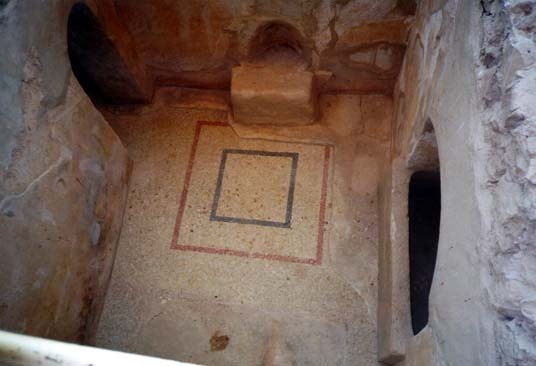 King Herod saw this and built a fortress and palace there between 37 and 31BC. In 70AD, the Jews revolted against the Romans and were defeated in a three-year war. 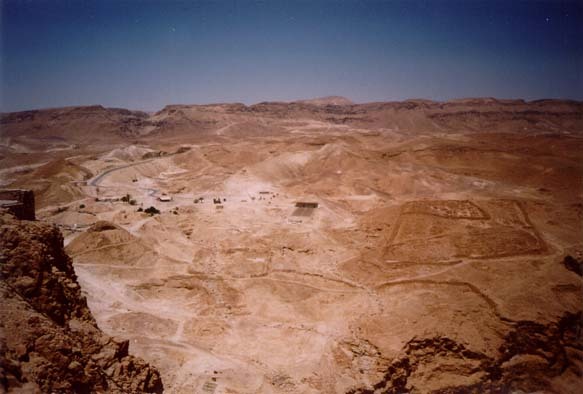 Masada became the final holdout of a large group of rebels. There was no easy way to attack the mountain, with the extremely steep sides and well-prepared defenders. 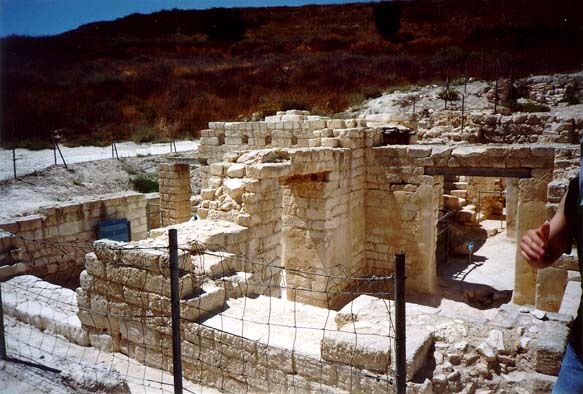 King Herod had seen fit to build cisterns for water and storehouses for food; as a result, the defenders had supplies for months. The Romans couldn't wait months. Deep into the desert, their situation for supplies was difficult, and camping a legion in the middle of the desert was difficult by itself. There were also the political consequences of a long siege. If rebels against the Empire could hold out in this one spot for months, it would send a bad message to other potentially rebellious groups. In order to bring the situation to a swift close, the Romans brought in slaves and built an enormous dirt ramp up the side of the mountain. 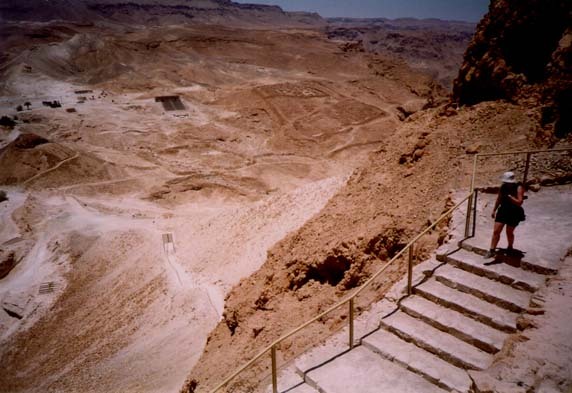 This ramp was steep and narrow, but it was much easier than climbing Masada directly. They wheeled a siege engine up the ramp to do battle, where they succeeded in destroying the section of the defending walls that faced the ramp, and retreated for the night. That night, faced with an entire legion streaming through the gap in their wall the next day, the Jewish defenders met. Knowing they would lose the battle, they had to choose between being enslaved and a suicide pact. The leaders chose suicide. 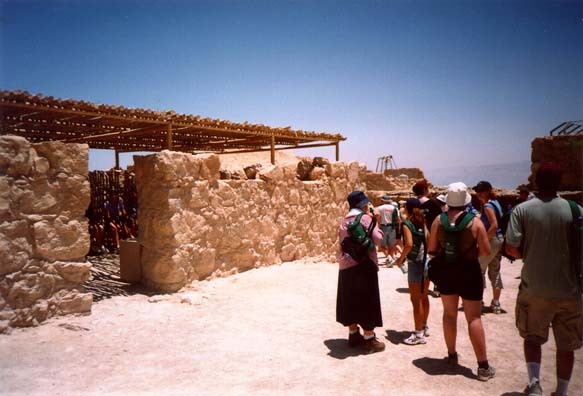 In the morning, when the Romans got to the top of Masada, they found only a handful of women and children. Everyone else was dead. 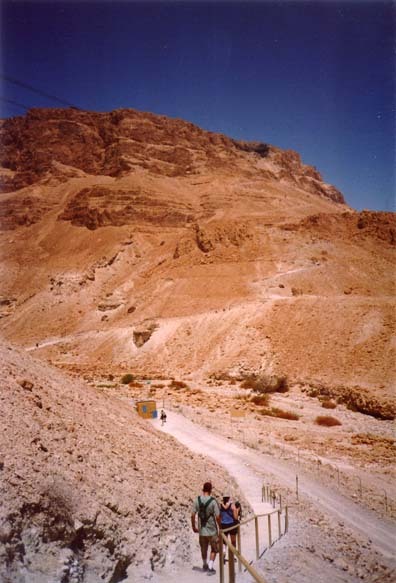 We had been told earlier that we would not be able to climb Masada. Some groups get to climb, but our schedule had dictated that we arrived too late. Groups who climb usually arrive very early in the morning, and we didn't get there until about 11:00. By this time the temperature had climbed well above 100F, and getting worse. It doesn't feel as hot as it sounds. Being in a desert, the air is extremely dry, and sweat works very well. However, dehydration and heatstroke are very real problems, particularly on a 1,200-foot climb over a path a mile and a half long. Instead, the plan was to take a cable car to the top. Our bus had left us as soon as we got out. It was circling around Masada, a trip that took it an hour and a half, to pick us up on the other side, where we would climb down once we finished seeing the sites at the top of the mountain. At the last minute, we were given a choice to climb the mountain if we wanted. Most people instantly said no; they didn't want to make the climb with the temperature heading towards the 110s. Also, those who took the cable car would reach the top much faster, and have more time to look around up there. About a third of the group wanted to climb just as badly, and I was one of them. An argument broke out as one person in the group, Igor, said he wanted to climb. He had suffered some mild heatstroke earlier in the day, but insisted that he was fine. Nirit, our medic, insisted he wasn't. He finally convinced her to let him climb, but she insisted on coming with him to make sure he was ok.
One of the first places where we stopped after I found the group was this meeting area, which is actually where the Jewish rebel leaders made their fateful decision almost two thousand years ago. We also stopped in the ancient synagogue that was used by the people who lived there during that time. In the picture, you can see a black line on the far wall. Everything below that line is original. The wall above the line is extrapolated and rebuilt from what archeologists think it would have looked like. 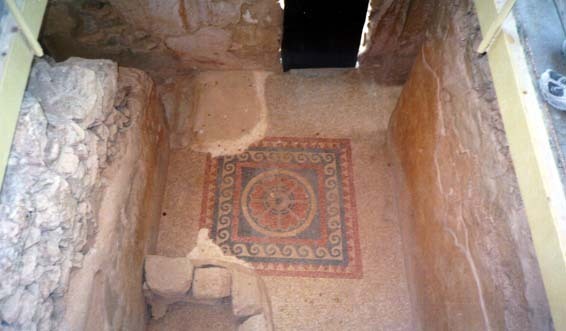 We also saw some beautiful mosaics (also here, and one more) built into the floors of some of the structures. By this point it was over an hour since I had started the climb, and the group behind me was still not to the top. It was nearly time to go down, and we were getting a little worried, particularly about Igor. Because we were going down the back way, we couldn't just get them and turn them around on the way down. We heard that they were almost up and started on the way down. Part of the path down is on the old Roman ramp. Yep, it's still there after all this time. It's amazing to think about just how much dirt had to be moved to make it. Of course, it wasn't a heroic effort. For the slaves who built it, it was work or die (or, often, work and die). Our next stop was an authentic Bedouin tent. Although it was set up for tourists, it was run by an actual Bedouin man who lived in another tent nearby. We all went into the tent, which accomodated our group of 35 easily, and listened to him explain his culture while we drank tea and coffee and ate pita which they made on a fire right in front of us. His speech was very interesting. For the most part, traditional Bedouin culture is stereotypically Muslim and primitive (I'm not claiming those two necessarily go together, mind you) in its treatment of women. A man is allowed to have up to four wives, the women have a separate side of the tent, and they must ask their husband/father/whatever man they're living with permission before going out. There is also the tradition of revenge. If a man kills a male relative, then it is permissable to revenge that by killing a memeber of the killer's tribe. Fortunately (otherwise this policy would lead to endless blood feuds, I would expect), it is also possible to demand payment rather than a life. A man is typically worth several camels, or more smaller animals. Ironically, a woman in this case is considered to be worth four men. A man who kills a woman "is obviously crazy", to quote our Bedouin, and the killing can therefore be revenged by killing four men from the killer's tribe. The death may also be settled by trade like with men, but with a price four times as high. Naturally, things today are a little more modern. The practice of multiple wives, although outlawed, continues to a lesser extent today. He said that every so often the police will ask about it. The answer is that the man has only one wife; the others are "just girlfriends". Today, many Bedouins live in cities, and they even have their own representative in the Knesset. Next, we moved to another tent where we were fed. We sat in groups of four, with each group sharing a single set of food. There was pita and hummus and a delicious mix of chicken and rice in an enormous bowl. Extra servings were constantly provided, and I ate an awful lot. From there, we went camel-riding. They had a bunch of camels (Dromedaries, one hump) outside the tent area. Each one was fitted with gear like you'd find on a horse, but fitted for a camel. They had each camel tied to the one in front and behind, in groups of four each. They also brought along a few donkeys, as there weren't quite enough camels to go around, although we sat two people on each one. Unfortunately, I must have been seated somewhat wrong. Sitting between the harness and the hump, there were some very unpleasant things happening between my legs. Apparently the other guys got this too, but not as badly. I finally had to get off at the halfway point and switch to a donkey, which was much more pleasant. Once we got back, we got off our animals, piled on the bus, and headed home. The trip back to Jerusalem took as long as the trip there. A lot of people slept on the bus. Between getting up early and the busy, physical day we had, we were all tired. Unfortunately, bus seats are built to my size even less than airplane seats are, and I couldn't find a decent position at all, and I finally gave up. An argument broke out between Adam, one of the group members, and just about everybody else in the front of the bus. He was advocating that the Israeli government should show more restraint when dealing with the Palestinians, that they should take the moral high ground and not attack even when provoked. Needless to say, this was pretty controversial. He ended up in a pretty loud argument with the Rabbi, the two tour guides, our other American guide, our guard, some other members of our group, and even the bus driver was getting involved a little. Once back at the hotel, we showered, ate, napped, and went back out again. It was the birthday of the Rabbi and another member of our group, so we had to celebrate. We went back to the observation point where we were on the first day. We lit candles and ate cake and sung and talked and generally had a great time. The city is as beautiful at night as it is during the day, but looks very different. The Dome of the Rock is nicely lit up, and there are some stars that can't be seen from where I live. It was a very memorable evening. We found out that the bus driver had specifically taken time to drive us out here; he didn't have to. We thanked him by singing "Three Cheers for the Bus Driver" the whole way back to the hotel. 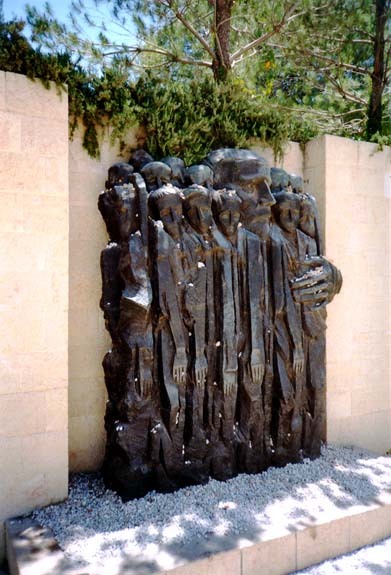 Our first visit today was to the Holocaust Museum in the Jerusalem area. 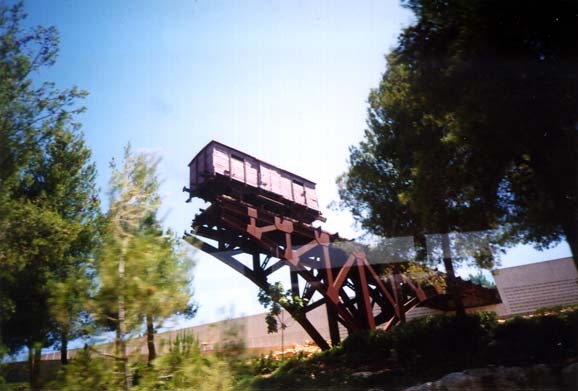 The most visible feature of it is a cattle car on a bridge. This car was actually used by the Germans to take Jews and other undesirables to the concentration camps. We had seen it a couple of times before as our bus went by it, but we actually went close to it today. It was very eerie to be so close to such a terrible piece of history. Once inside the museum, we went to their hall of communities (I don't know if that's what the name was, but it's close). It's a list of European Jewish communities destroyed in the Holocaust, with each one written in Hebrew, English, and whatever the native language was. It's a very big, solemn place, and we spent a long time there. On our way to another part of the complex, we got a nice view of Jerusalem. The whole area is filled with planted trees. Each tree is dedicated to a gentile who helped Jews during the Holocaust in some way. There are a couple thousand trees at least, each one with a little name plate in the ground next to it, telling who the tree is for. Around this time we went through the main museum area, which is a long complex which tells the entire story of the Holocaust, from ancient traditional anti-semitism through its rise in the 1930s, through the war and liberation. They have a lot of amazing artifacts, pictures, and stories. We went through a hall filled with precisely-set-up mirrors and candles, with no other lighting. Having just come in from the bright Israeli summer sunshine, it was impossible to see anything other than what looked like miles upon miles of candles. After we came out of that, we saw some evocative statues. 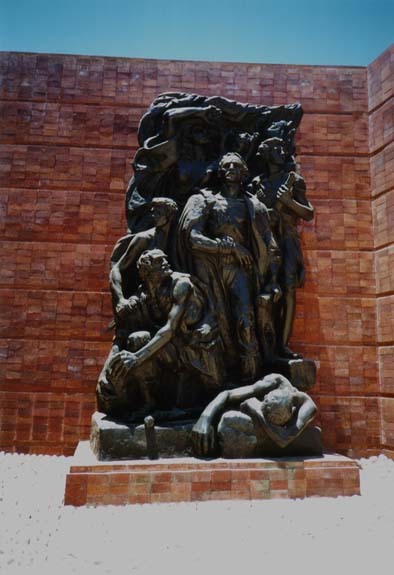 The second one is about the Warsaw Ghetto uprising, an ultimately failed revolt against the Nazis that killed hundreds of thousands of people. 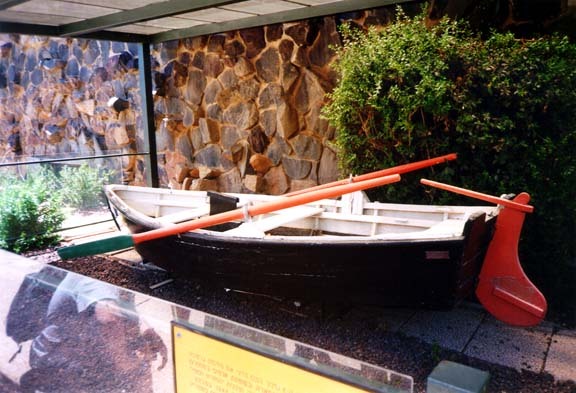 We also passed this rowboat, which was one of hundreds used by the Dutch to evacuate their Jews to neutral territory. Out of 8,000 Jews in the country, they saved about 7,200. Our last stop was a low square building with no windows. Inside, there's a raised area for people to stand and then there are all the names of all the concentration camps in raised stones on the floor, and a single small flame in the center. When the door was closed, that flame was the only illumination in the building. It was almost completely dark and quiet while we prayed. On our way back to the hotel, we stopped by the Knesset (Israeli parlaiment) building. 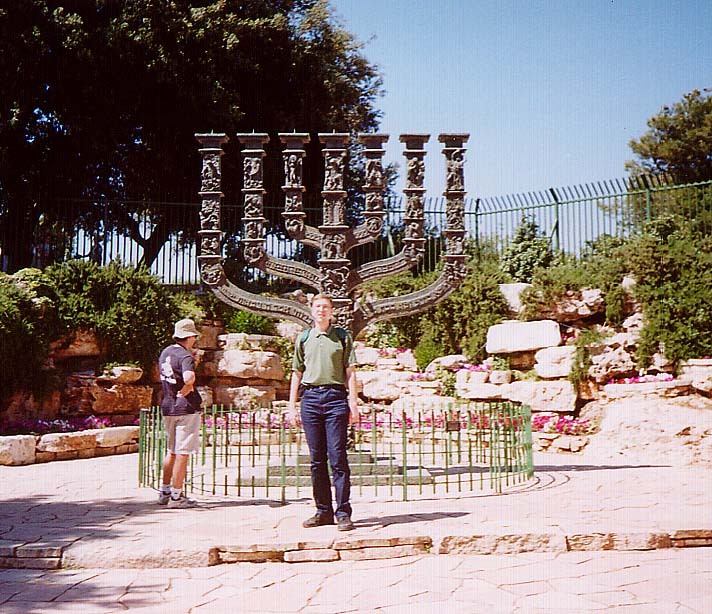 Across from the Knesset is a giant menorah that the British gave to Israel after they gained independence in 1948. Then we went over and saw the Knesset itself. It's actually surrounded by a high fence, but I got close enough to take the picture between the bars of the fence so they don't show up. Right as I took this picture, a guard with an automatic rifle came up to us and told us to step away from the fence, as we were setting off the security alarms! Although it was only 4:00 in the afternoon, that was the end of our tourist activities for the day. 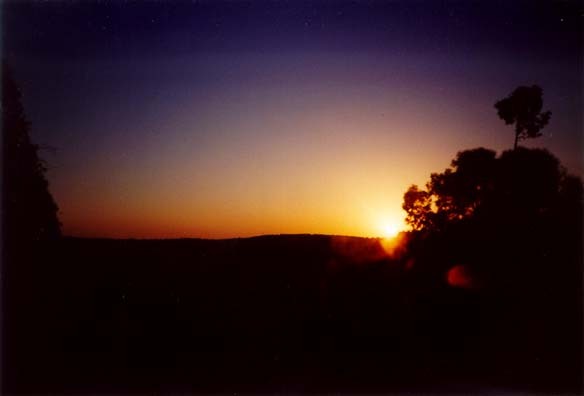 At sunset on Friday evening begins Shabbat, which lasts until sunset Saturday. During this time it is religiously forbidden to do various sorts of work, use cars, turn on electric lights, and things like that. Although there is no legal enforcement to these rules, Jerusalem seemed to pretty much shut down for Shabbat. In concession to the religious among our group, we didn't take the bus anywhere during that time. Once we got back to the hotel, we changed into somewhat more formal clothes and then headed to the Western Wall for services. It was actually within walking distance from our hotel, although it took about half an hour to get there. The area right next to the wall was divided into two sections, one for men and another for women. There were a lot of different groups, each one doing things their own way. There were the very solemn groups standing around and reading the Torah, and then there was our group where we got in a big circle and sung and danced for what seemed like hours. By the time we were done it was dark, and we went back to the hotel for dinner. Dinner was a big affair. Although Shabbat happens every week, there is still a lot of celebration associated with it. This, of course, will vary from person to person, but that is generally the case, and was certainly the case for our group. There was singing and dancing beforehand, then we ate. The food was the standard fare for the hotel, decent but not wonderful, and afterwards there was even more singing and dancing. I was worn out, so I left early. Although we were allowed to sleep in on Saturday morning if we wished, I wanted to go to services and so I had to be up reasonably early, although not as early as we had been getting up normally.